A wall vanity is the best way to make the most of a wide master bathroom. Of course, there are a variety of great functional reasons to get a vanity like this, too. For almost the same price as a single sink and vanity, the double version gives you two vanities, two mirrors, and two sinks. This wall vanity setup effectively eliminates much of the common bathroom bickering over whose turn it is. Trying to figure out a simple way that you can change your bathroom design without having to redo the entire bathroom? Perhaps the easiest way to do this is to install a beautiful bath sink in the bathroom. Simply adding a vanity sink can give your bathroom a whole new look that you are sure to love. These vanity sinks are one of the hottest trends in bathroom decor at this point in time. I remember being a kid and admiring one of the elegant antique cabinet vanities we had in our house. It stood about five feet tall, and it had a dark stained finish. The legs of the vanity were designed to look like large bear claws. It was a very unique vanity, and one that I remember vividly. That’s what an antique bath vanity is supposed to do. It should grab your attention and capture your imagination, leaving an indelible imprint in your mind’s eye. You’ll have a lot of choices to make from a variety of wonderful modern options the next time you decide to remodel your bathroom. Adding a personal touch or a novel sense of style to your home is a great way to enhance its natural visual appeal, and one of the best ways to achieve this is by installing an attractive white vanity.Installing modern bathroom vanities is one of the most effective ways of infusing your home interior with a unique sense of style. Oak vanities have been important aspects of any bathroom for a long time now. Let’s take a trip back in time about a hundred years. This is a time before cheap plastic was invented. Wood still reigned supreme, and since the assembly line had yet to be invented, wood craftsmanship was a very valuable trade. A sense of care and pride went into what we now call antique vanities. While copies of certain patterns were certainly made, because they were not mass-produced each one seemed to have a sense of uniqueness. The owners of these oak vanities had a pride of ownership, a feeling that the vanity was theirs and theirs alone. With so many different styles of bathroom vanities many people feel as though they may be getting in a little bit over their heads. But even so, your unique bathroom deserves some unique bathroom vanities, which add character and charm and also ample storage space for all your organizational needs. For all those toiletries you don’t really want to keep out in the open Installing a vanity for your bathroom remodel is critical for these reasons. Take some time before buying a bathroom vanity to really think about what you’ll be storing in it. You do want to ensure that you have ample space before you spend any money. Why even bother with a vanity cabinet, no matter how beautiful it is, if it doesn’t give you sufficient storage space? If you are needing a way to take the most advantage of the large space you have in your master bathroom, there is nothing better than placing a wall vanity in there. Not only is this an easy solution for your excess space problem, it also provides plenty of organizational benefits as well. For almost the exact cost of a single vanity and sink, a double vanity will actually give you two cabinets, two sinks, and two mirrors to aid efficiency in the bathroom. You won’t have to fight over whose turn it is to utilize the sink anymore with great double wall vanities! There are a number of easy ways to totally remodel your bathroom without breaking the bank. 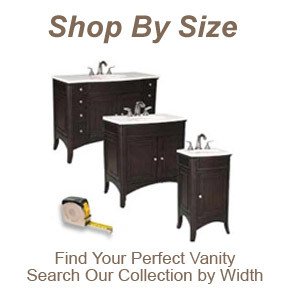 One fantastic option is to install a sink vanity, which will truly transform the look of your bathroom. It sounds simple, but adding a sink vanity may be all it takes to add that great look your bathroom needs. These vanity sinks are one of the hottest trends in bathroom decor at this point in time. They are instant design classics that will add value and charm to your bathroom. What is the secret to the intrigue and allure of vanities cabinets? To really understand this, we may need to go back in time. About a century ago, before the invention and proliferation of cheap plastics, wood was still the reigning king of furniture materials. Because the “assembly line” was not yet a widely-used system, wood craftsmanship was a truly valuable trade that required ample artistry and expertise. Making vanities cabinets involved lots of care and pride, and artisans poured themselves into their work. And while many vanities were imitated or copied, they were never mass produced. Because of this, all of these vanities had their own unique character and personality. The owners of these vanities cabinets had the pride of knowing that they possessed a unique vanity that was built just for them. It’s surprising to know that a number of households in the United States are bereft of a good bath vanity. What’s a vanity? My point exactly. Many people remain unaware of the functions of bathroom cabinets much less think about installing one.